Yedid Nefesh is a piyyut of uncertain authorship attributed to Elazar ben Moshe Azikri (1533-1600) commonly found in the morning baqashot of Sepharadi siddurim and as a petiḥah for Kabbalat Shabbat in many siddurim. It’s attribution to Elazar is due to his inclusion of the piyyut in his Sefer Haḥaredim (1588). (The images below are of pages with Yedid Nefesh handwritten by Azikri.) A version of the piyyut “with noteworthy text, spelling and pointing”Stefan C. Reif, The Hebrew Manuscripts at Cambridge University Libraries: A Description and Introduction Cambridge: Cambridge University Press, 1997, page 93. may be found on folio 146 (verso) of Samuel b. David b. Solomon’s Commentary On the Book of Numbers (ca. 1437 CE). Presumably, this text was added to the 15th century manuscript sometime in the 17th century after the popularization of Yedid Nefesh. 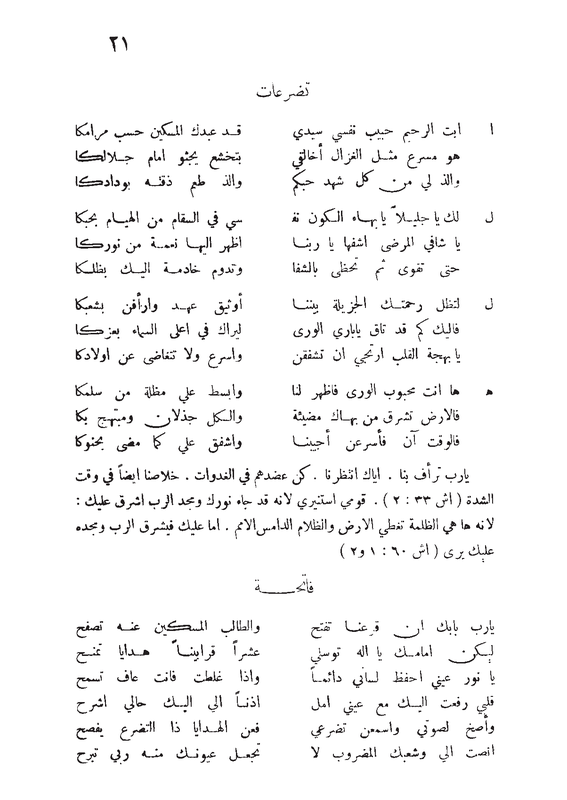 This is a faithful transcription of Yedid Nefesh translated into Arabic from סדור פרחי سدور فرحي Siddur Farḥi (nusaḥ Sefaradi, minhag Egypt 1913, 1917) by Hillel Farḥi (1868-1940). (A copy of Siddur Farhi can be ordered from the Farḥi Foundation here.) Transcription of the Arabic was made by Wikisource contributor Avigdor24, here. Please help to proofread and improve this transcription. Join us in the digital transcription of Siddur Farḥi on Hebrew Wikisource. 1. Stefan C. Reif, The Hebrew Manuscripts at Cambridge University Libraries: A Description and Introduction Cambridge: Cambridge University Press, 1997, page 93. “ידיד נפש | Yedid Nefesh attributed to Elazar ben Moshe Azikri ca. 16th c. (Arabic translation by Hillel Farḥi, ca. 1913)” is shared by Elazar ben Moshe Azikri with a Creative Commons Public Domain Dedication 1.0 Universal license. Please reciprocate for any adaptation or redistribution of this work by (1) properly attributing the work to Elazar ben Moshe Azikri, Dr. Hillel Farḥi (translation) and Wikisource Contributors (proofreading), (2) clearly indicating the date you accessed the resource and whether any changes have been made (and if so, please be in touch with us and leave a comment below so that we might note your adaptation or improvement), (3) providing a link back to this source, and (4) specifying the Creative Commons Attribution-ShareAlike (CC BY-SA) 4.0 International copyleft license under which this work was shared.